The next phase of EUV development has begun—making EUV more predictable and potentially more mainstream—and it’s looking to be every bit as difficult and ambitious as other developments in advanced lithography. In the early days of EUV development, supporters of the technology argued that it was “still based on photons,” as opposed to alternatives like electron beam lithography. While that’s technically true, even a casual glance at EUV optics shows that these photons interact with matter differently. EUV photons emerge from a plasma, focus via reflective optics, and slam into the photoresist with 91.6 eV, more than 10 times as much energy as their counterparts at longer wavelengths. The energy of a photon (hc/λ) increases as the wavelength (λ) decreases. At shorter wavelengths, the energy dose supplied by the source is distributed among fewer individual photons. That fundamental relationship is the cause of stochastic print failures. There simply aren’t enough photons to give a clean exposure profile. The other side of the coin, though, is that each photon delivers more energy to the resist, leading to more complex interactions. Imec’s recently announced Attolab, a joint project with KM Labs, seeks to understand these interactions in detail. 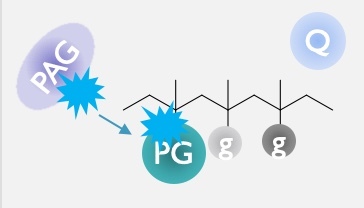 In a DUV resist, the incoming photon triggers the release of photoacid, which in turn breaks a protection group loose from a polymer molecule in the body of the resist. The de-protected molecule becomes soluble in developer. In EUV resist, however, each photon initiates a cascade of interactions. An incoming EUV photon has so much energy that it doesn’t interact with the molecular orbitals to any significant degree. John Petersen, principal scientist at Imec, explained that it ejects one of an atom’s core electrons. In conventional chemically amplified resists, carbon is the most common atom and accounts for most of the interactions. In metallized resists, the metal atoms have a larger capture cross-section, which may improve overall absorption. In either case, the photoelectron recombines with the material, ejecting another electron. This cascade of absorption/emission events, with energy dissipating at each step, continues until the electron energy drops below about 30 eV. Only after energy falls below 5 to 10 eV, where electrons have quantum resonance with molecular orbitals, does the familiar resist chemistry of older technologies emerge. At this level, molecular structure and angular momentum drive further interactions. More accurate understanding of the interactions between molecular orbitals and incoming electrons might allow the creation of resists and under layers that absorb incoming energy more efficiently. It might provide new insights into the behavior of mask and pellicle materials, as well. Given the source brightness limitations inherent in EUV, each step in the optical path would benefit from materials with lower absorption losses. And particularly as high numerical aperture exposure systems emerge in the next few years, thinner resist layers are needed to minimize edge effects and reduce the risk of pattern collapse. More efficient absorption would simplify the tradeoff between resist thickness and exposure dose. The need to understand photon absorption is not new, but other research has looked primarily at interactions in the picosecond (10-12 second) range and slower. That time scale is adequate for 193nm photon interactions and other lower energy processes. With EUV photons, though, ionization processes happen on femtosecond (10-15 second) and faster time scales, while the initial absorption happens in a few attoseconds (10-18 second). Currently, no laboratory is able to examine photochemistry at attosecond time scales using 13.5nm light. While some researchers have used electron beams to get to the required energies, electrons have a different work function, different interactions with photoresist, and a different reaction pathway. Paul van der Heide, director of materials and components analysis at Imec, noted that the studies planned for the Attolab require advances in both source and detector design. For the source, the lab’s proposed approach starts with a femtosecond laser at about 92 eV. In between pulses from the main laser, a lower energy “pump” pulse can excite electrons in the material to higher levels. Adjusting the timing between the pump and the main laser allows the source to achieve very short interaction times at the photoresist layer. Though the system isn’t yet built, Petersen said the lab hopes to study interactions in the sub-20 attosecond to 200 picosecond range. Other researchers have reached 2 picoseconds, providing data to help validate the new results. Then, time-resolved electron and infrared spectroscopy and electron reflectometry can be used to examine electron scattering and electron interactions, showing what molecules are being excited and how. 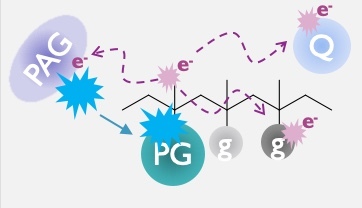 At lower energies, molecular orbitals become more intertwined, giving more complex spectra. The lab plans to compare experimental results with time-dependent DFT simulations. The lab expects to achieve first light by October 2019, Petersen said, and will start work with infrared time-resolved chemistry studies. He expects they’ll still be developing experimental and analytical methods at this time next year, with first published results likely in summer or fall 2020. While the domains of interest have been simulated before, time scales shorter than 2 picoseconds are unexplored experimental territory. Intended to become one of the world’s leading facilities, the Attolab represents one of the largest research investments in Imec’s history, with major contributions from both the materials and advanced patterning organizations. What issues remain, and how they could affect manufacturing at 7/5nm. This is not a new problem; just look at photon interaction in old fashioned photographic emulsions and the problems of determing loci of laten image formation versus image resolution in photography. Such problems have been well researched and documented in high spatial resolution light mircoscopic autoradiography for more than 30 years. Very nice article, Katherine, the most understandable I have seen on EUV resist. Note, however, that every one of those steps you describe is stochastic, adding uncertainty! Which way does each photon, electron, acid, etc. go? High praise, indeed, thank you! Yes, there is randomness on top of randomness, and that’s without even considering random effects in the other aspects of pattern capture and transfer. Not a new *kind* of problem but, as the article notes, a somewhat unexplored experimental domain.